Some of my random thoughts on God's grace and mercy, the glory of Christ, relationship with God being our ultimate source of joy, justification, sanctification, the righteousness of Christ imputed to the Elect, God's unending love and faithfulness, and whatever else comes to mind! 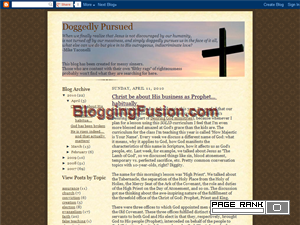 This what your Doggedly Pursued Blog Ad will look like to visitors! Of course you will want to use keywords and ad targeting to get the most out of your ad campaign! So purchase an ad space today before there all gone! If you are the owner of Doggedly Pursued, or someone who enjoys this blog why not upgrade it to a Featured Listing or Permanent Listing?